The Sundance Film Festival will feature five Irish productions at next year’s festival, which takes place in Utah, USA next January. The line-up includes one new Irish feature, Lee Cronin’s ‘The Hole in the Ground’ starring Irish actress Seana Kerslake; two international co-productions, Sophie Hyde’s ‘Animals’ and Sacha Polak’s ‘Dirty God’; alongside two Irish documentaries, Garry Keane and Andrew McConnell’s ‘Gaza’ and Kim Longinotto’s ‘Shooting the Mafia’. ‘Brooklyn’, ‘The Lobster’, ‘Sing Street’, ‘Calvary’, ‘The Guard’, ‘School Life’ and ‘It’s Not Yet Dark’ comprise just some of the major Irish films of the last decade to have screened at Sundance, with the festival presenting a consistently strong line-up of Irish titles down through the years. ‘The Hole in the Ground’ is directed by Lee Cronin and stars Seána Kerslake (‘A Date for Mad Mary’) with the title produced by John Keville and Conor Barry for Savage Productions. ‘Animals’ is an Irish/Australian co-production, directed by Sophie Hyde, with Cormac Fox producing for Ireland’s Vico Films alongside Sarah Brocklehurst, Rebecca Summerton and Sophie Hyde. The film starsHolliday Grainger (My Cousin Rachel) and Alia Shawkat (Arrested Development). ‘Dirty God’ is a powerful film about motherhood, courage and self-acceptance. Jade is a young mother recovering from an acid attack that has left her with severe facial burns. Her face has been reconstructed, but her beauty is gone. Distanced from her daughter, Jade finds solace in the hidden world of online liaisons where she uncovers the passion and connection she's craved. But when her life is turned upside down once more, those around can do little to halt her descent. As her family life and friendships start to crumble, Jade takes drastic action, finally finding the path back to her daughter and herself. This documentary brings together an eloquent, resilient, funny and courageous group of souls, on whose lives the world lens is often trained, without ever capturing their true essence; their struggle, survival, resilience and sense of family, which goes to the very heart of humanity and human nature. 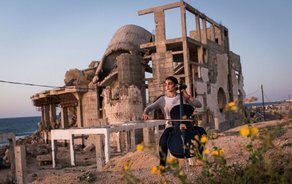 The film unfolds a portrait of the ordinary people of Gaza who attempt to lead meaningful lives beyond the rubble of perennial conflict. Free of the cliché of news reportage, ‘GAZA’ reveals a complex land of intrigue and highlight the beauty of the human condition and the warmth and humour that lies bubbling beneath the surface of this truly remarkable place. In sharp contrast to the all-pervasive romanticised and glamorised media image of the Sicilian Mafia, Kim Longinotto's feature documentary ‘Shooting the Mafia’, unflinchingly explores the stark reality of life, and death, under the oppressive yoke of the Corleonesi Mafia. Photographer Letizia Battaglia stood up to the Mafia and it is through her lens that we enter this world of ritualised slaughter, omertà, semi-religious oppression and feudal control. The scale of the mafia’s brutality and power is revealed through a combination of rare archive footage, newsreel and personal photographs and memories. The power of Letizia's photography and the bravery and dedication of people like her helped to finally bring to an end the brutal reign of a bunch of small town thugs who's reign of fear reached as far as the Italian presidency.